Magento 2 Social Login extension is the essential extension for any Magento site to speed up customer login process. The extension supports various social accounts for login. Besides convenient social login block, Magento 2 Social Login extension also allow AJAX pop-up for quick login and sign-up. Install Magento 2 Force Login extension to require customers to log in before visiting specific pages. Admin has ultimate control over which social platforms are available for customers to log in and signup. With Magento 2 Social Login extension, you can manage the number of social accounts in the social login block and add more if you aren't satisfied with the list we already set up. Magento 2 Social Login extension allows you to place the social login block at any position of any page using widget support. So you can put the login block anywhere you want, for example, Home Page, Login Page...and even on the AJAX login pop-up. Admin can enable the reCaptcha in the login, register process, and forgot password pages or pop-up to avoid spam accounts. Type and design of this reCaptcha can be easily customized from Magento backend. Magento 2 Social Login extension gives you the control to decide pages redirected after login and register. For example, home page, account dashboard… or use custom URL. 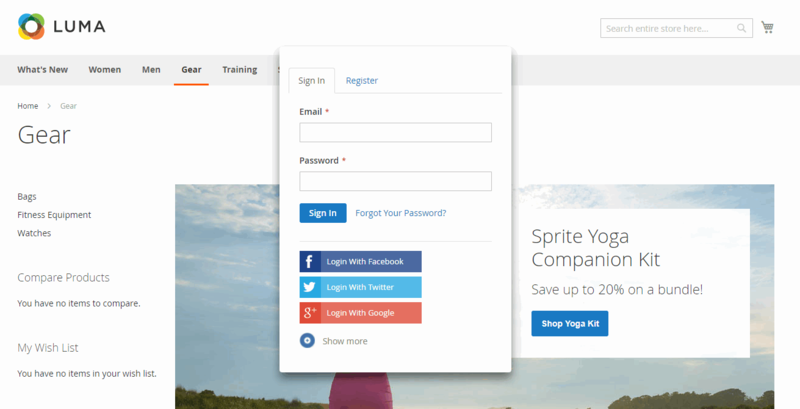 Why Magento 2 Social Login is your must-have extension? With Magento 2 Social Login extension, customers can signup or log in on a site quickly within a few clicks instead of wasting time on filling in register or login form. Ajax pop-up is also a method to save up time customers might spend on loading new pages. The ease of login or register process will inevitably encourage customers to interact more with your website. While traditional sign-up form might drive customers to bounce out immediately due to the complication and amount of time they have to spend on that step, log in with social media method can give them more incentive to sign up on your site. Since many people tend to forget the information they used for sign-up like email, username, and password, social login function will help them get rid of remembering all of the above information. Magento 2 Social Login extension also benefits shop owners by encouraging site visitors to share content with their social network, which is one of the most potent free word-of-mouth advertising. By syncing information from social media accounts, shop owners can avoid false or incomplete information customers might type in the registration form. Magento 2 Social Login extension provides reCaptcha an effective way to prevent spam accounts created by robots. Thumbs up for great plugin! It is a wonderful extension which works flawlessly with any social login features. It saves customers' login time and promotes them to come back later. Thanks and keep it up! Thanks to Magento 2 Social Login extension, traffics and customer engagement to my web increase dramatically as login process becomes quicker and quicker. This truly supports my sales. Magento 2 Ajax Social Login extension is exactly what I need for my store. To my surprise, the function of this low-price extension is good and no big error found. The login process through social accounts really encourage customer to sign up on my site. Nice job BSS. After installation i had a lot of problems with this module. Contacted BSS and they are friendly and willing to help. The only problem i have with them is that they fix the problem at hand but do not test the module at all. Like you can understand it becomes a very lengthy ticket. And just remember if you buy this module they will not refund your money, like stated on their site. The extension provides the basic yet very essential feature to enhance login process on site. Our customers have been sending good feedbacks since we install it. Great work! This extension is more than I wish. I love that it supports unlimited social accounts. Free installation and instant support are also big plus point! Good job, BSS! Keep it up! How to Login by a Click with Ajax Social Login for Magento 2?